Can You Be Denied a Medigap Plan? 21 Aug Can You Be Denied a Medigap Plan? Americans who receive their health insurance through Medicare may want to purchase extra coverage through a Medigap policy. But your ability to buy a Medigap policy depends on where you live. One in four people with Medicare also have supplemental Medigap coverage to help cover their co-pays, deductibles, and other out-of-pocket costs. But that varies widely across states. For example, 51% of people with Medicare in Kansas have Medigap plans. Medigap plans are required to allow adults 65 and older, a one-time, 6-month open enrollment period to buy a Medigap plan, when they first enroll in Medicare Part B. After that open enrollment period, if you want to buy a Medigap plan, you can be denied coverage based on a pre-existing condition or face a pre-existing condition exclusion period. But didn’t the ACA provide protections for people with pre-existing conditions? Yes, but Medigap plans were specifically carved out of those protections. So, Medigap plans can deny coverage or impose pre-existing condition exclusion periods, even if individuals are eligible for Medicare. Except if you live in CT, MA, ME, and NY. 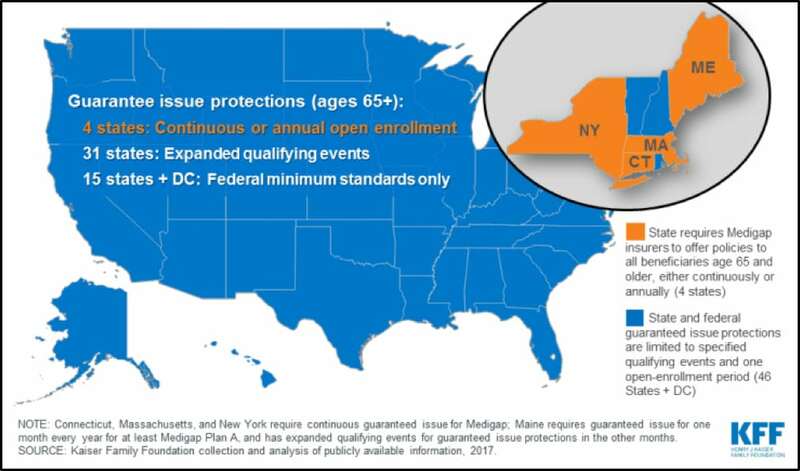 These states require Medigap plans to offer guaranteed issue protections either continuously or annually for all Medicare beneficiaries ages 65 or older. But if you don’t live in one of those four states, and for example, you move from a Medicare Advantage plan to original Medicare and you want to buy a Medigap plan, you may be denied that Medigap plan if you have a pre-existing condition. There are a few exceptions, such as if you move to a new area. States can also create other rules about these plans. 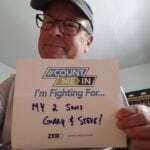 For example, 28 states require Medigap plans to offer coverage to Medicare beneficiaries whose employer makes changes to their retiree health coverage benefits. The rules are also differentif you access Medicare because you have a disability and are under the age of 65. Because of that, only 5% of those on Medicare under the age of 65 have a Medigap plan. Read our Quick Guide on Medicare, or watch this webinar. Medicare’s website allows you to type in your zip code and it shows you the different Medigap policies available to you. Medicare also provides a chart comparing Medigap plans A-N and their different benefits. Learn moreabout Medigap coverage differences across states.